1S. Anees is with the Bharti School of Telecommunications Technology and Management, Indian Institute of Technology Delhi, New Delhi 110016, India. 2M. R. Bhatnagar (e-mail: manav@ee.iitd.ac.in) is with the Department of Electrical Engineering, Indian Institute of Technology Delhi, New Delhi 110016, India. 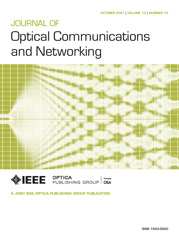 In this work, the performance and the capacity analysis of a fixed-gain amplify-and-forward (AF)-based dual-hop asymmetric radio frequency–free space optical (RF–FSO) communication system is performed. The RF link experiences Nakagami-m fading and the FSO link experiences Gamma–Gamma turbulence. For this mixed RF–FSO cooperative system, novel and finite power series-based mathematical expressions for the cumulative distribution function, probability density function, and moment generating function of the end-to-end signal-to-noise ratio are derived. Using these channel statistics new finite power series-based analytical expressions are obtained for the outage probability, the average bit error rate (BER) for various binary and M-ary modulation techniques, and the average channel capacity of the considered system. The same analysis is also performed for the scenario when the FSO link undergoes significant pointing errors along with the Gamma–Gamma distributed turbulence. As a special case analytical expressions for the outage probability, BER, and channel capacity are also presented for a dual-hop asymmetric RF–FSO system where the RF link is Rayleigh distributed. Simulation results validate the proposed mathematical analysis. The effects of fading, turbulence, and pointing error are studied on the outage probability, average BER, and the channel capacity.